The 1970s-era legislation has been haunting politics and restricting abortion access for far too long. Two seemingly innocuous pieces of legislation recently ran into unexpected roadblocks in Congress this month: a bill to permanently fix the Medicare doctor-payment formula, and legislation to aid victims of human trafficking. The culprit in both cases was abortion language that would mirror the infamous Hyde Amendment. Many Democrats insist the provisions must be removed before they vote for either bill. The debate has metastasized so quickly that it’s now holding up the confirmation of Loretta Lynch to be attorney general; Senate majority leader Mitch McConnell said he would not bring her nomination to a vote until Democrats relent on the human-trafficking bill. You’ve probably heard of the Hyde Amendment before—the oft-employed shorthand is that it’s the thing that prevents taxpayer dollars from going to abortion services. Ever since 1976, the bill has been a goblin haunting domestic politics, often throwing unrelated debates into chaos. What if, once and for all, Democrats just got rid of it? In many ways, the Hyde Amendment’s mythology outpaces its actual effect. As the dispute over these two bills shows, the Hyde Amendment isn’t an all-encompassing federal ban. Otherwise, there would be no fight here, because its principles would automatically be applied. The Hyde Amendment actually deals mainly with Medicaid dollars, and prevents healthcare providers who have Medicaid patients from providing them abortion services. This means it has a devastating effect on low-income women. Research has shown that lack of Medicaid funding for abortion services creates serious delays for low-income women seeking help, as they must save money necessary to pay for any procedures. Sixty-seven percent of poor women who had an abortion said they wanted to have it sooner, according to a Guttmacher Institute study. For some, the wait ends up being too long, or the cost is too burdensome—several studies estimate that somewhere between 18 and 35 percent of women on Medicaid continue their pregnancies despite wanting an abortion because the funding isn’t available. The eponymous Representative Henry Hyde was pretty straightforward about the discrimination that his amendment created when it was enacted. “I certainly would like to prevent, if I could legally, anybody having an abortion, a rich woman, a middle-class woman, or a poor woman. Unfortunately, the only vehicle available is the…Medicaid bill,” he said in 1977. “If rich women want to enjoy their high-priced vices, that is their responsibility…that is fine, but not at the taxpayers’ expense,” he said during another debate. Though limited to Medicaid, the Hyde Amendment’s fundamental logic has inspired similar bans on abortion services for federal inmates, for Peace Corps volunteers, and for members of the military. Obamacare was almost derailed over the question of whether the Hyde Amendment would apply to all the new government healthcare spending; an executive order from President Obama assured that it would. 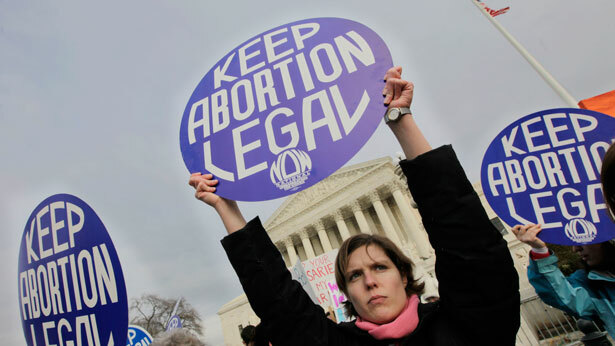 In each case, the argument is always: should we apply the Hyde Amendment? Getting rid of the Hyde Amendment could therefore reverse the debate, and put pro-choice politicians on the offensive instead of constantly playing defense against Hyde creep. Logistically, it might not be that hard. The Hyde Amendment expires every year—and is renewed by Congress annually when it appropriates money for the Department of Health and Human Services, which runs Medicaid. Slaughter and four other House members embarked on a national bus tour to repeal the Hyde Amendment last summer. Pro-choice activists are starting to look harder at getting rid of the Hyde Amendment too. URGE, a group that works to mobilize younger Americans around reproductive issues, has been running campaigns to make people aware of the issue. URGE has held rallies in twenty cities, and delivered petitions to members of Congress urging them to stop renewing Hyde. If there is finally a push to get rid of the Hyde Amendment, it wouldn’t be the first time. As ThinkProgress recently noted, Bill Clinton actually made this a campaign pledge way back in 1992, and later asked Congress to act. Hyde, still in Congress at the time, was able to narrowly defeat the effort, and it’s never been tried in earnest since. The chances of doing so in a Republican-controlled Congress are nil, but movements like these generally need some momentum. There will also another Clinton seeking the White House in the coming months. If she is looking for things to campaign on, getting rid of the Hyde Amendment and its anachronistic, discriminatory logic is a good place to look.